Nelson News : Read All About It! - Journalist Sheree Homer has released a brand new book about our idol. 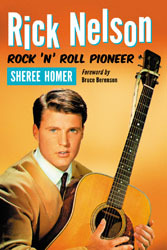 Rick Nelson: Rock 'N' Roll Pioneer has been released. And it's a real labour of love. It has 206 pages, which includes 47 photos and a forward by the well known Rockabilly DJ Bruce Berenson. You can purchase a copy by clicking here. You can also purchase the book direct from Amazon by clicking here. - Click here to read a recent interview with Rick's youngest son about his exciting plans to bring Ozzie & Harriet back to life after becoming the manager of the Nelson estate, following the passing of his uncle David. - The 2010 annual Club get-together will be taking place in Gwynedd, Wales from the 30th April to the 3rd May. Further details can be found by clicking here. - "Like many of you I was shocked and saddened by the recent and tragic death of Peggy O'Neal. My heartfelt condolences go out to her son, family and friends. After seeing a photo of her and Ricky together in an issue of the newsletter, I wrote asking for a copy for my collection. She complied and we became penpals, and as the 1993 fan club convention in Los Angeles grew closer she and I worked together through the mail on projects. Some were putting together flyers, and the color photocopies of Rick's 45 picture sleeves. Once the convention was over and she retired as Vice President and unknown to me at the time recommended to Andrew Wilkinson that I take over her place. When I was told that the job was mine if I wanted it, I was flattered, surprised and said 'hell yes'! That was 15 years ago, and this is still the best job I ever had, and a whole lot of fun. I've always appreciated what Peggy did for me. So once more kid, thanks! Details to follow, so keep checking back. This is very sad and depressing news. Our beloved club member and one time US VP of the club, Pegy O'Neil has been murdered by her handyman at her home in Albuquerque, New Mexico. I can't believe it. I've known Peggy for many years, and it was she who organised our trips to the USA in such a wonderful way. Below is a copy of a news item from her local town, please be advised that some members may find this distressing. Rest in peace Peggy, you will be dearly missed. - ALBUQUERQUE (KRQE) - A 39-year-old handyman is behind bars, charged with the murder of the woman who hired him to fix up her house in northwest Albuquerque. Police report that Kenton Warnock, 39, left clues with his cousin and his mother about the murder of Peggy O'Neal, 60. Warnock told his cousin he killed the 60-year-old woman he was working for and was suicidal about it, according to the police report. The suspect had been working for O'Neil for less than a month. The police report quotes Warnock's mother as saying Kenton Warnock killed the woman by accident. Police said they believe it was no accident. This weekend they found the body of the O'Neil wrapped in a blanket in the garage underneath a mattress. She had been beaten to death. "We are awaiting autopsy information for very specific information as to how that beating may have taken place, in other words was an instrument used or was it all by fisticuffs," Albuquerque Police Spokesperson John Walsh said. The woman's family from out of town called police when they hadn't heard from her. Police said they had been searching for her for two days, and she was hard to locate because she recently moved across town. "An unspeakable, terrible crime has been committed, not only to our shining star and this family but to this community. 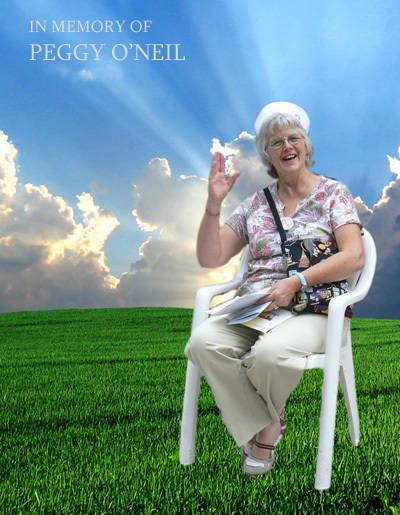 May her star shine upon this earth and may justice be thorough and served swiftly," O'Neil's son said in a statement. Police said Warnock has an extensive criminal history in Ohio. He came to New Mexico after serving more than five years in an Ohio State prison for drug and aggravated battery charges. His crimes include a 2002 conviction for beating a woman who worked as a security guard at a discount store because she tried to arrest him for shoplifting. Throughout the many arrest reports, Warnock admitted to being a severe heroin addict. Warnock was living with his mother until she kicked him out. His address on the police report is listed as transient. Monday, he was charged with murder and his bond was set at $500,000. Police said that more charges could follow. - Club member David Nelhams has informed us of the sad news that yet another ex-Stone Canyon band member has died.Following a long fight with cancer, Allen Kemp passed away on the 25th of June 2009. David remembers meeting Allen many years ago: "I was particularly saddened by this news because when Pam & I met the Rick & the Band on their U.S. bases tour of England in 1970, I remember what a really nice guy he was. We found him particularly warm & considerate & he even bought us drinks during the evening! A real gentleman." As well as working with Rick and the band, he was also a long time member of the New Riders of the Purple Sage. He is survived by his wife Anne, his daughter Caitlin, son Danny, son-in-law Theodore, brother Lonnie Kemp, sister- in-law Joan Kemp, nieces Stacey and Shannon, nephew Brad, and the loves of his life, his granddaughters, Bianca & Justyne. Article from Media Life:Auburn�s Allen Kemp part of Rick Nelson, New Riders of Purple Sage bands Guitar player, singer had roots in mid-1960s Denver music scene By Gus Thomson, Journal Staff Writer Sometimes people are so far removed from past fame that it takes a factoid or two buried deep on the obituary page to provide a glimpse into a life lived in a larger arena than Auburn�s. Such was the case last week with the notice of the death of Allen Kemp. An Auburn resident, he died of cancer at the age of 62 late last month. Who was Allen Kemp? Well, he was a much-loved husband, father, uncle and son, his death notice noted. But he was also an outstanding guitar player and singer whose star shone most brightly during the 1960s, 1970s and early 1980s. Doing some digging, Media Life found Kemp�s most notable association was with Rick Nelson, the former teen idol who revived his career in 1969 with the help of the Stone Canyon Band. Bass player Randy Meisner and Kemp, on lead guitar, combined with Nelson on three-part harmonizing with the band. The sound would be a preview of one that Meisner would take with him when he left the band in 1971 and joined The Eagles. TOP 10 RECORD In 1972, Nelson, Kemp and The Stone Canyon Band would release �Garden Party,� and it would reach No. 6 on the Billboard Hot 100 singles chart. The song details Nelson (and Kemp�s) appearance at a rock revival festival in 1971 at Madison Square Garden that also featured 1950s stars like Bo Diddley and Chuck Berry. Nelson and his band faced a cascade of boos when they played their new, country-rock material. Nelson�s truculent take on events that day turned into the band�s biggest hit. For Kemp, the road to what was perhaps the highest point of his music career in terms of popular success started in earnest in his home state of Colorado with a mid-1960s band called the Soul Survivors. Bolstered by local stardom, including a legendary gig in Denver opening for Bob Dylan, the group headed for Los Angeles. With another group bearing the same name (and a hit to come for that group in 1967 with �Expressway to Your Heart�) the Soul Survivors changed their moniker to The Poor and began to find a following in Sunset Strip clubs. Performances opening for major acts like the Animals and Sonny & Cher followed but the band never broke through on record. OPENED FOR HENDRIX In 1967, The Poor was flown to New York for what would turn out to be another legendary performance � this time for the first U.S. appearance by the Jimi Hendrix Experience. But the band�s work was more a footnote in 1960s rock history. Meisner and Kemp had worked together since their Denver days so when Meisner linked up with Nelson, Kemp was a natural fit to follow. Kemp�s work with the Stone Canyon Band would end shortly after �Garden Party� and he would eventually become an integral part of another well-known band, the New Riders of the Purple Sage. Starting as a bass player and then moving on to rhythm guitar, Kemp would contribute to the NRPS sound between 1978 and 1982. He�s on the 1982 disc �Feelin� All Right.� He also co-wrote a song to Roger McGuinn�s first album after leaving The Byrds. The song is called �Somebody Loves You.� Kemp�s music and life will apparently live on, with a Canadian fan and friend of the musician directing a music and film project. Ricky On The Cover "Now Dig This"
- There's a great photo of a Rockin' Ricky on the front cover of the July issue of Now Dig This. To get your copy follow the link by clicking here. Beware Bootleg Adventures - Several website are advertising "The Adventures of Ozzie & Harriet" on DVD featuring all 14 seasons and 435 episodes for sale on the Internet. IT IS A BOOTLEG and does not have the authority of the Nelson family (or anyone else for that matter) for it's release. It is a BOOTLEG RIP OFF that one of our members (at least) has been duped into buying, and it is of VERY POOR QUALITY. It is shipped from China, so we urge you NOT to purchase this, and ONLY purchase items that have the permission of the Nelson family. Tom Brumley, a legendary steel guitarist who contributed to the "Bakersfield sound" of Buck Owens and the Buckaroos in the 1960s before spending 10 years performing with Rick Nelson, has died. He was 73. Brumley died Tuesday at Northeast Baptist Hospital in San Antonio, eight days after suffering a heart attack, said his wife, Rolene Brumley. During his years with Owens, from 1963 to 1969, Brumley traveled the world and played on landmark recordings such as �Together Again,� "I've Got a Tiger by the Tail" and �Act Naturally.� Brumley, whose "pure" steel sound was known in the music industry as "The Brumley Touch," received an Academy of Country Music Award for No. 1 Steel Guitarist in 1966. "I grew up watching the Buckaroos," said country music singer Marty Stuart, who recorded with Brumley and knew him for 20 years. "To me, they were country music's answer to the Beatles.Tom's steel guitar parts stand as monumental and foundational works that are considered textbook in the vocabulary of country music. "He was also, in my opinion, one of the cornerstone guys that kind of bridged country music and rock 'n' roll, as well, with his Ricky Nelson works." Brumley left Owens' band in 1969, after Nelson invited him to play steel guitar with his band for his "Live at the Troubadour" album. "It was a godsend being asked to join Rick's band, and I still think 'Garden Party' was a highlight of my recording career," Brumley told Canada's Edmonton Journal in 2005. "Initially, I only accepted the offer to do four shows with him at the Troubadour, but I enjoyed it so much I stayed with him for 10 years." Brumley said that Nelson, who died in an airplane crash on New Year's Eve 1985, "was such a great guy, and we had such a close relationship that I still stay in touch with his boys." Brumley later spent three years recording and touring with Chris Hillman and the Desert Rose Band. From 1989 to 2003, he performed with his sons, Todd and Tommy, in the Brumley Family Music Show in Branson, Mo. Over the last decade, he performed or recorded with artists such as Chris Isaak, Merle Haggard, Glen Campbell, Waylon Jennings, Ray Price, Reba McEntire, Rod Stewart and Martina McBride. Born in Stella, Mo., on Dec. 11, 1935, Brumley was the third of six children. Their father was Albert E. Brumley, a gospel singer, composer and music publisher whose songs included "I'll Fly Away," "I'll Meet You in the Morning" and "Turn Your Radio On." At 14, Brumley began playing bass in a band with his brothers Al, Bill and Bob (and later Jackson), who played at local music festivals and on local radio and TV stations. Brumley, who began playing the steel guitar in 1954, had a two-year stint in the Army in Germany and worked at his father's music publishing company. In 1962, Brumley's brother Al, who had just signed with Capitol Records, asked him to play steel guitar on his second recording session. It was a fateful occasion. "Buck Owens was down at the studio and heard Tom play on my session," Al Brumley recalled. "He told Don Rich, one of his sidemen, that if he ever had a chance to hire Tom, he would." After the Capitol Records session, Brumley and his wife lived for a time in North Hollywood while Brumley worked the club scene. Later, after Brumley got a job working in construction for his wife's father in Kingsland, Texas, he got the career-making call from Owens. "Of course, Tom was excited, but he was disillusioned with the night scene and the bars and things where most everybody had to play at that time," Rolene Brumley recalled. "He said, 'I don't think I want to pursue the music business because of all that.' "My dad talked him into it [saying], 'You know, if you don't do this, you'll wish you had. So I want you to try it. You can always come back to Kingsland, but at least you'll know what you want to do and won't be sorry.' " Brumley was later inducted into the Texas Steel Guitar Hall of Fame and the International Steel Guitar Hall of Fame. "He had his own style," Al Brumley said. "If you heard his steel, you knew who it was. A lot of recording artists used him just to get his sound." His brother, he said, "worked real hard at his craft all through his life. He spent hours and hours and hours on that steel guitar. There is only one guy I can think of that spent as much time or more on an instrument and that would be Chet Atkins. "He had that thing, 'I could never get enough.' That's what made him so great. He was an absolute perfectionist." his sister, Betty Brumley-Pockrus; six grandchildren and a great-grandson. 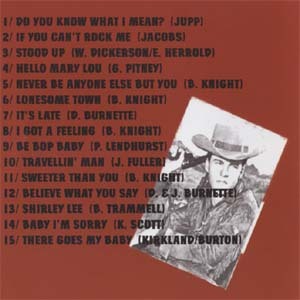 I'm Walkin' Alternate Version - Long time fan Lyn Erickson has found an alternate version of "I'm Walkin". Printed below are the lyrics to both the original version and the alternate version. You can also find it by going to the Club Trips section. This looks like a really lovely hotel and promises to be an unmissable weekend. Rio Bravo: 2 Disc DVD -Warner Home Video (WHV) and Paramount Home Entertainment (PHE) will join forces to honor the great John Wayne on May 22 -- the week that would have been �the Duke�s� 100th birthday. With 9 new titles due the studios combined DVD libraries now offer 48 Wayne popular classics. The lead title in the promotion is Rio Bravo in both a Two-Disc Special Edition ($20.97 SRP) and Ultimate Collectors Edition ($39.92 SRP), This is now also available on Blu Ray too!. New digital transfer from restored picture and audio elements. Easy to be Free: MySpace - The tribute CD has got it's own MySpace page. Further details of this release can be found by scrolling through the news. Click on the album art to go to the MYSpace page. 2007 Caribbean Cruise/U.S.A. Tour - Peggy has been in touch with details of the proposed Cruise she is organising for this year. Peggy has put in a lot of work to organise the trip, so I'm sure it will be a most enjoyable holiday for all Ricky fans. Plus it's bound to be a great way to introduce your family and friends to the joys of Ricky and his music. There are 24 episodes (at least one from each season) on 4 discs. There are 8 performances by Ricky, none of which are tagged on to the end. They are part of the episodes. You can access just the songs on each disc from the special features menu. Commentary Tracks with David Nelson and Ricky's youngest son Sam Nelson. "The Story Of Ozzie & Harriet" - a short featurette. An original promo for a special episode (included in this set). There's an audio only special feature of the radio show episode where David and Ricky first perform as themselves. There are two trivia quizzes. One focussed on Ozzie and Harriet, and the other focussed on Dave and Rick. Sounds pretty good so far. The release date is 1st of May. This will be a Region 1 (U.S.) release. You can also find it by going to the Club Trips section. I've also, finally, added the review for our great weekend in Bridlington last year, to this section. Leaving 20 Lowdale Avenue, Scarborough, YO12 6JW. Thursday 6th of July, at 1.15. pm. to St. Mary's Church, and then afterwards to Woodlands Drive Crematorium. Easy to be Free: The Songs of Rick Nelson - A new release is upon us... Finally hitting record store shelves on JUNE 6, 2006 is the latest Planting Seeds' various artist release "Easy To Be Free: The Songs of Rick Nelson" (PSRCD-046)--20 artists/tracks celebrating the legacy of underrated rock/folk/country pioneer Rick Nelson. The LP includes a wide array of artists from friends to great singer/songwriter/bands. The set features exclusive tracks from Marshall Crenshaw, Linda Draper, The Voyces, Astropop 3, 1888, The Primary 5 (Paul Quinn of Teenage Fanclub), John Beland (Rick Nelson/The Flying Burrito Brothers, etc. ), Nic Dalton (from The Lemonheads) & The Gloomchasers, Liz Durrett (Vic Chesnutt), Dolorean w/ Holy Sons (Yep Roc Records), Jeffrey Foskett (The Beach Boys/Brian Wilson), Oed Ronne (from The Ocean Blue), Allen Clapp (from The Orange Peels), John McEuen (Nitty Gritty Dirt Band)/Jim Ratts and Runaway Express, The Autumn Leaves plus lots more! $1.60 of the sales of each CD supports CancerCare. It'll be distributed via Darla, Carrot Top, Revolver USA, Tonevendor, Amazon.com and more. You can also purchase it and view the complete track list by clicking on the image below. "A drastic reinterpretation of someone else's song can be exciting, though also disastrous, but there's something refreshing about a tribute album that leaves the experiments for someone else. Easy to Be Free is a true tribute - a bunch of musicians who obviously love Rick Nelson's music singing and playing them straight-ahead, trying to capture some of the grace and spirit of them. It's a rock-solid, enjoyable album, with no major disasters and a fair share of renditions that show a genuine understanding of Nelson's gifts as a songwriter and performer, and yet are not so direct that they come off like cheap imitations. Instead the contributors' own musical personalities shine through, but so does Nelson's, at very moment. Including both songs Nelson wrote and songs he didn't, and capturing the varied stages of his career as teen pop idol, as country-rock singer, etc. The album kicks off with The Primary 5, Paul Quinn (ex-Teenage Fanclub)'s current band doing an energetic "One X One," followed by a nice and smooth "Poor Little Fool" from "The Voyces. Linda Draper's spellbinding "How Long" properly demonstrates the dreamy quality of Nelson's music. Astropop 3 keep their take on "Life" pure and simple, and benefit greatly for it. Micheal Barrett's "Nightime Lady" is hushed and romantic. Liz Durrett's "Try (To Fall in Love)" swoons in slow-motion, like her own songs, while capturing, as many of the songs do, the sensitive, introspective aspects to Nelson. The whole affair feels particularly attuned to why Nelson is a musician to pay attention to, yet it's also a completely listenable and rewarding collection. Thanks to Ann and Sandie for the info. Carlsberg use Ricky for advert - You may have seen that the latest avert for carlsberg beer uses Ricky singing "Lonesome Town". It's played over images of townsfolk lamenting the fact that the trucks are exporting the beer. It's a good avert and showcases Ricky very well. look out for it! Good news from Louisianna - Marcia Wyse has written to us to say that U.S. club member and Louisianna resident Judy Cahill, her family, pets and home, all survived Hurticane Katrina in fine shape, and are safe sound. That's great news! Those who wish to make a donation to the American Red Cross, who are doing sterling work in bringing aid to those less fortunate than Judy, can do so by clicking on the image below. New Photos Added - There are some new photos in the Ricky And Family section of Teenage Idol. Also the second page of Rick On The Cover has been updated to show larger images. Search The Site - You can now search the entire site using a keyword of your choice. Simply visit the Search Site area of the Life Section of the site and type in the word you are looking for. Simple! New Forums - After all the hassle with spammers infiltrating the last guestbook, I have re-launched Conversation as a new and hopefully spam free forum. Feel free to check it out and add your comments on all things relating to Rick and the club. Unfortunatley this means that I have had to lose all previous posts, apologies to all concerned. Hardy Boys on DVD - The first series of the Hardy Boys & Nancy Drew Mysteries has been released on DVD. The series starring Shaun Cassidy, Parker Stevens and Pamela Sue Martin was a big hit in the seventies. This 2 disc set includes all 14 episodes including Rick's performance in the episode The Flickering Torch Mystery. This really is a great chance to see concert footage of The Stone Canyon Band at their peak. The DVD is Region 1, so you will need a multi-region player outside of the US/Canada. You can learn more by clicking the cover artwork. You can purchase a copy with free delivery from DVD Box Office. Meanwhile the first 2 series of McCloud are due on DVD soon. Rick appeared in the first episode of series 3. With luck this series will be released in the future. "John Wayne is on top form as the leather-faced sheriff of a Texan border town whose attempts to bring a murderer to justice are threatened by an armed blockade by the killer's brother. Still, despite The Duke's intrinsic star power, he shares the spotlight gallantly with his rag-tag posse: Dean Martin (playing wonderfully to type as the town drunk), Walter Brennan (the definative old coot) and Ricky Nelson (holding his own against his heavyweight compadres as a hot-headed young buck). The result is a prototypical buddy movie, brimming with warmth, camaradarie and uplifting man's-gotta-do heroics." 6: Resevoir Dogs, 7: The Royal Tenenbaums, 8: Ocean's Eleven, 9: The Usual Suspects, 10: The Breakfast Club. 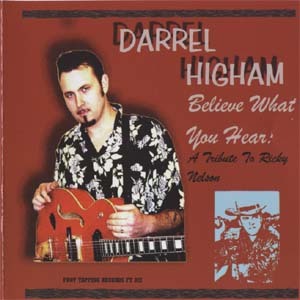 Darrel Higham releases Rick Tribute CD - Club Friend Darrel Higham has released a tribute CD to Rick. Entitled "Believe What You Hear", it has features some of Rick's best loved early work. You can purchase a copy from Foot Tapping Records.